You are facing Battery A, which stood on Rightor Hill, a high spot on Crowley's Ridge. Defended by the 29th and 36th Iowa and the 33rd Missouri, it anchored the north end of the Union line, approximately one and one-quarter mile northeast of here. You are standing on Crowley's Ridge, the series of hills that surrounds old downtown Helena. To capture the city, the Confederates had to go over or around the ridge. Battery A covered both Sterling Road, which came in from the north, and Old St. Francis Road, less than a mile to the west. 2. Coming to the Aid of Fort Curtis Marker (on right). from their position in front of Battery A. By the time the Confederates retreated from Battery A, another Confederate force was attacking Battery C. Batteries B and D assisted the Union defenders here with artillery fire, but Battery A was too far away for its guns to be effective. Anticipating a Confederate assault, General Frederick Salomon moved troops and artillery from Battery A to Fort Curtis. 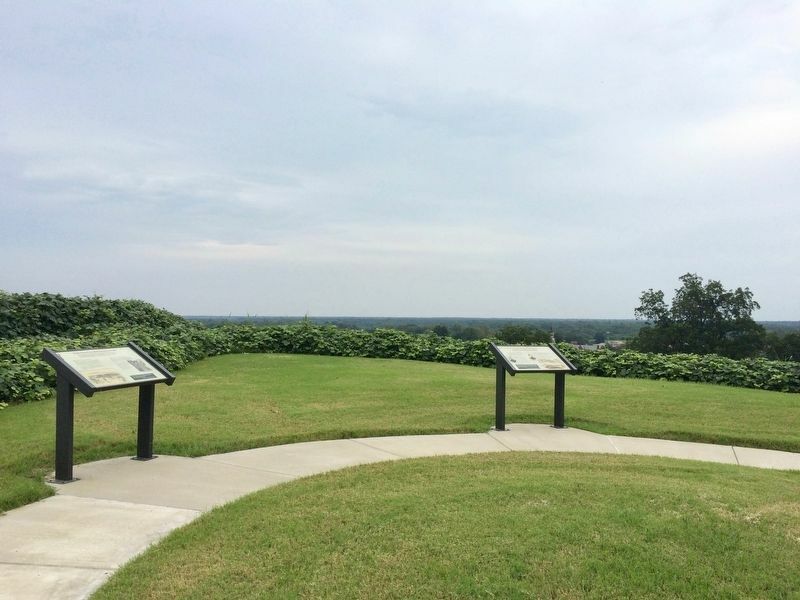 When the Confederates attacked the fort from Battery C, the men and artillery from Battery A were ready. The attack failed miserably, the Confederates suffering heavy losses. Soon afterward, they retreated from the battlefield. They advanced steadily and briskly while six heavy guns from our fort and also several companies of infantry that had been driven in from the outer works were mowing them down by platoons. 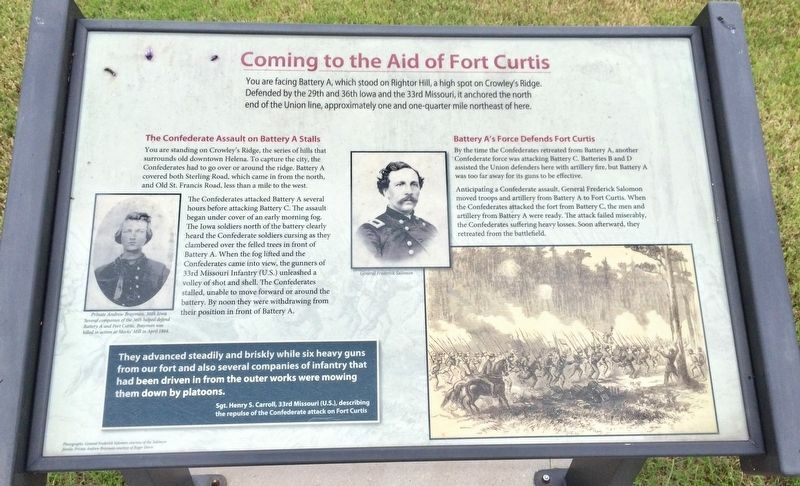 Several companies of the 36th helped defend Battery A and Fort Curtis. Brayman was killed in action at Marks' Mill in April 1864. Location. 34° 31.578′ N, 90° 35.798′ W. Marker is in Helena, Arkansas, in Phillips County. Marker can be reached from Yorkshire Drive 0.1 miles east of Audubon Drive when traveling east. Touch for map. Marker is at or near this postal address: 1100 Yorkshire Drive, Helena AR 72342, United States of America. Touch for directions. Other nearby markers. At least 8 other markers are within walking distance of this marker. Their Guns Pounded Graveyard Hill (here, next to this marker); The Avenging Fire of the Gunboat (a few steps from this marker); A Cemetery Becomes a Battleground (within shouting distance of this marker); The 33rd Missouri Spikes the Guns (within shouting distance of this marker); Battery C Revealed (within shouting distance of this marker); A Short Lived Confederate Victory (within shouting distance of this marker); "We are well fortified" (within shouting distance of this marker); The Confederates Take Battery C (within shouting distance of this marker). Touch for a list and map of all markers in Helena. More. Search the internet for Coming to the Aid of Fort Curtis. Credits. This page was last revised on September 4, 2017. This page originally submitted on September 4, 2017, by Mark Hilton of Montgomery, Alabama. This page has been viewed 96 times since then and 5 times this year. Photos: 1, 2. submitted on September 4, 2017, by Mark Hilton of Montgomery, Alabama.